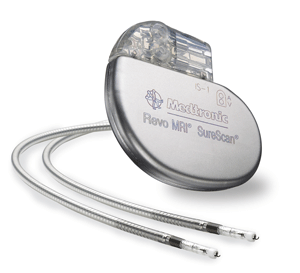 Northern Virginia Radiology Consultants, (NVRC) is proud to be one of the first groups in the Washington, DC Metropolitan Area to offer MRI to patients with the Medtronic Revo MRI SureScan pacing system. We are also one of the first groups in the area to offer MRI to patients with the Biotronik ProMRI pacing system. Both systems are classified as MR-conditional and allows patients to undergo MRI under certain specified conditions. Previously, a patient with any pacemaker system was considered unsafe for imaging with MRI. Now, patients with either the Medtronic Revo SureScan pacing system or Biotronik ProMRI pacing system may undergo MRI under the guidance of the radiologists at NVRC. How do I know if I have an MRI compatible pacemaker? The cardiologist who implanted your device will know if you have an MRI compatible pacing system in place. Most patients are also given a medical device card containing detailed information including the model and serial numbers of the pacing system implanted. 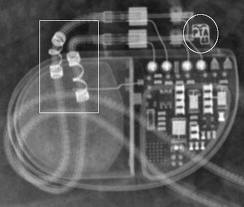 This x-ray shows the characteristic features which identify a Medtronic Revo MRI SureScan Pacemaker device and leads. Does my cardiologist need to provide me with anything before my MRI? Your cardiologist will need to complete a form specific to your pacemaker prior to scheduling your MRI. You or your cardiologist may download a copy of the form by clicking on the link below. What specific safety conditions must be met prior to scheduling an MRI? In order to perform an MRI safely with the Revo MRI SureScan pacemaker system, we must ensure the following conditions have been met. Are any other pacemaker systems FDA approved? Currently, the Medtronic Revo MRI SureScan pacing system and the Biotronik ProMRI pacing system are the only FDA-approved system. How can I learn more about MRI and pacemaker systems? If you have questions about your scheduling your MRI please contact our radiologists through the Contact link at the top of the page.